So, here’s one way to do it. 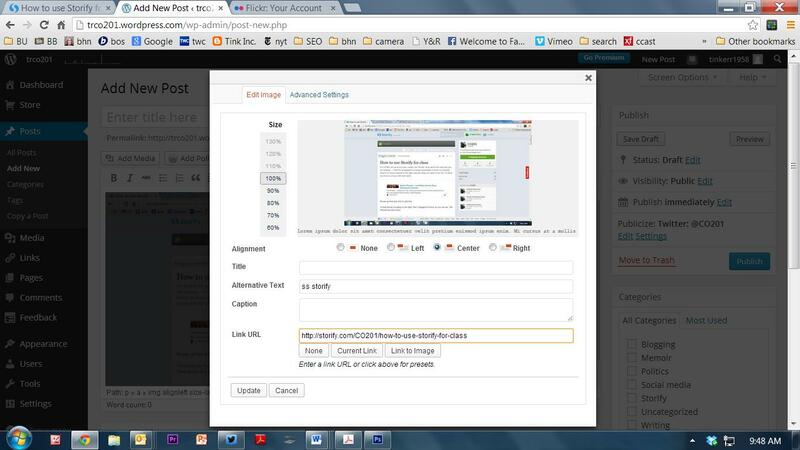 Save a screenshot of your Storify, and add a link.To save a screen shot on a PC you hit a button called “PrintScrn. ” then paste in onto a Word document, click on it and save it as a JPG. You may need to open it in a photo editor like Photoshop to crop it.On the Mac, save the whole screen with shift-command -3 and crop it with shift-command- 4. Be a little neater than I was. That small bit of partial text on the right looks bad. But, make sure you change the URL/address when you upload the photo to the post. Then instruct your readers to click on the image for the screen shot. Also hyperlink some text to the url. I would rip that title in COM201 but it works sort of as a headline. So, this embed didn’t work out real well. Let’s start with a link then and I’ll show you the half-assed way to get you Storify on to your WordPress page. I wish these sites would play well together. 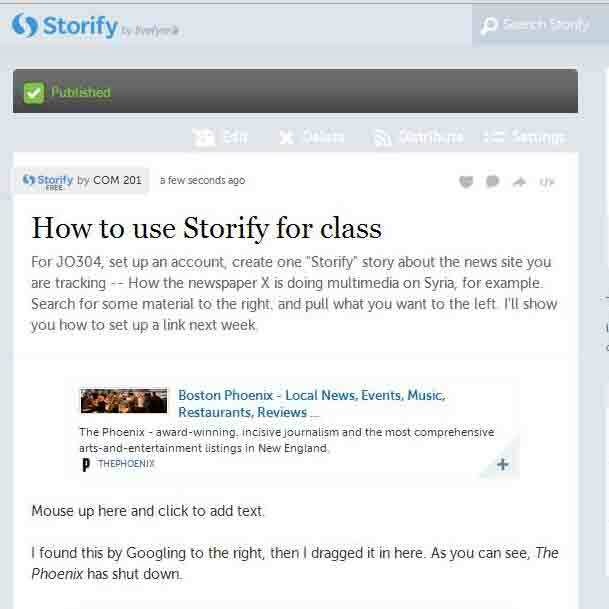 For JO304, set up an account, create one “Storify” story about the news site you are tracking — How the newspaper X is doing multimedia on Syria, for example. Search for some material to the right. and pull what you want to the left. I’ll show you how to set up a link next week. The Phoenix – award-winning, incisive journalism and the most comprehensive arts-and-entertainment listings in New England. I found this by Googling to the right, then I dragged it in here. As you can see The Phoenix has shut down. Storify is now telling me to save, which I will do by clicking “save now” above. I also know that there was a panel last night on the closure of the Phoenix, so I searched the hashtag #phoenixmit. You can also past a link in to the right and find material that way. I found this in my original Google search and pulled it in to get some video in here. For JO304, set up an account, create one "Storify" story about the news site you are tracking — How the newspaper X is doing multimedia on Syria, for example. Search for some material to the right. and pull what you want to the left. You’ve been Storifyed — or is it Storified? WordPress should play nice with embeds. Click here for a Storify of some of your Tweets. Working together can be tricky for both whistleblowers and journalists. Here’s some help. The Boston Globe’s #Metro Minute lives on page B2. It needs a better spot on the home page.